Another set of Geekbench results claiming to be from an iPhone 7 have appeared online, just a day before the device is set to be announced. We've seen alleged Geekbench reports before – screenshots that turned out to be fake – but emerging so close to the phone's unveiling and appearing on the PrimateLabs site, this one may have more legitimacy to it. The device is identified as an "iPhone9,3", which may refer to a third model of iPhone 7, given that the iPhone 6s and 6s Plus carry the hardware strings "iPhone8,1" and "iPhone8,2", respectively. And yet the RAM for the device is stated as 2GB, whereas previous rumors imply that the iPhone 7 Plus will get 3GB RAM, suggesting this is a 4.7-inch device. The scores indicate significant performance gains owing to the A10 chip expected to feature in the iPhone 7. 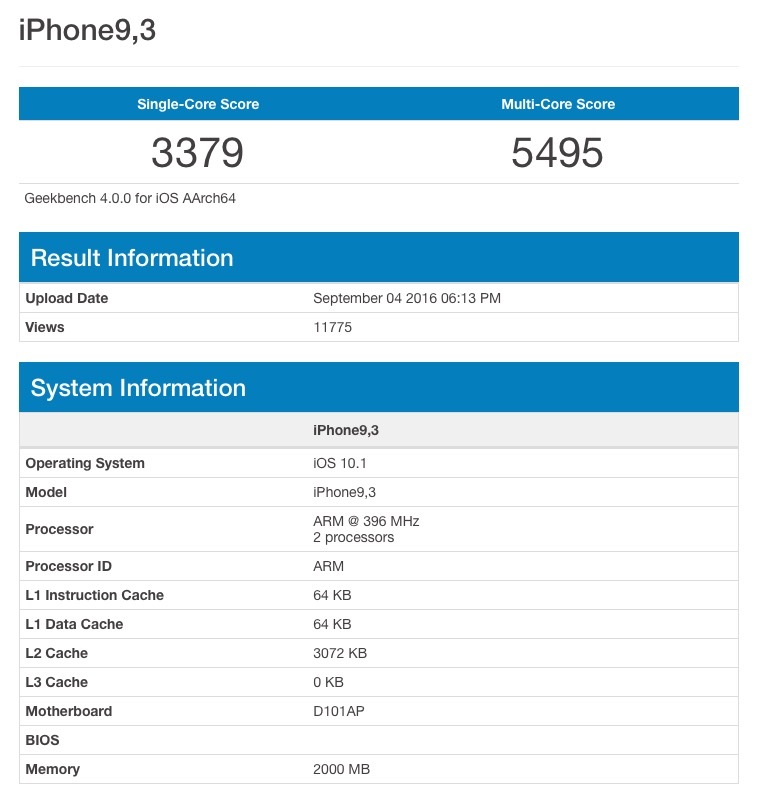 If the results are legitimate, a single-core score of 3379 and multi-core score of 5495 show that a 400MHz A10 processor easily beats the performance of the A9 in the iPhone 6s Plus, which scores 2490 and 4341, respectively. On these results, the A10 also outperforms the 2.2GHz A9X chip powering the 12.9-inch iPad Pro, which returns Geekbench scores of 3224 and 5466, respectively. Interestingly, the report says the handset is running a future version of iOS 10 (10.1) that has yet to be seeded to developers, implying that the test was conducted internally, apparently with full knowledge that the results would become public. As noted, suspension of belief is advised without any official confirmation, but we shouldn't have to wait long before more concrete results begin appearing in the wild. Apple is expected to reveal its new iPhones tomorrow, along with a second-generation Apple Watch, and refreshed Beats products. Apple should also provide final release dates for iOS 10, macOS Sierra, tvOS 10, and watchOS 3, and it may have other product and service updates to announce. Check back with MacRumors.com for live coverage and through the @MacRumorsLive account on Twitter. This is literally the easiest thing in the world to fake. Front page …? Even if real, the device is obviously not really running at 400MHz. Processor speeds are often incorrectly reported on GeekBench. It seems pretty likely (besides possibly just being fake) that it could be a legitimate benchmark result but with an incorrect clock speed. Confirmed by a GeekBench engineer. Wasn't it always the case that the 'An+1' outperforms the 'AnX ' chip? I've already spoken about this in other threads, but there's so much wrong with this benchmark. These can be easily faked. Also the specs seem completely illogical: 400MHz processor? Not to mention the never seen before iPhoneX,3 naming. It's clear this isn't the iPhone 7 or 7 Plus. Guy from Geekbench says clock speed is not reported by the device, just guessed by the software, and can be wrong. If anything, if it was a fake, it would likely report a plausible clock rate. For all the things I hate about Apple recently (feature separation on phone models - GAG- and other stuff) their ARM team continues to be beyond top-notch, frankly astounding. They deserve serious credit for their chip design which continues to keep the iPhones as the fastest phone/computer that is always with you. They continue to innovate in this arena in a big way. Make calls, look at emails, text people and look at the internet, facebook and twitter. Yes, a great need for "desktop-class computing performance". These new iPhones are going to be the fastest and most powerful smartphones anyone has ever seen before. We're talking desktop-class computing performance in these latest-gen devices. Truly incredible. I can't wait to see what I can do with them. The 396MHz note can be the CPU dynamic frequency scaled, and that GeekBench hasn't been patched to counter such behavior. We've seen this before.